Isn't it great when things happens at a quick pace? Just this week I got to know about Web Montag (Web Monday) which is a very web 2.0, grass-roots casual series of presentation & mingle events. Anyone can host a Web Monday, and anyone can participate. It's built upon a "speakers corner" kind of ideal; You contact tho host of the event and get you ten minute presentation, and then there's some kind of main event from some company, or just some person who's got an interesting project. I've been lucky enough to get my employer to sponsor Beer, Pizza and WiFi for the occasion, as well as somewhere to be, so I basically just have to host, meet nice people and have a great time. Yes, do some speaking and waving at screens as well, but that's just fun anyway. This first event, the 5th of February will focus on Dojo, Thin-server technology and the newly released Ajax server Jaxer, from Aptana, which I'll do an hour-long piece on. If you live in, or know that you'll be in Sweden the 5th, and want to go to the event, add your name to the Wiki page; http://webmontag.de/doku.php?id=stockholm_sweden So I know how many beer to ask for. After I had my first release of Bunkai up and running, I was contact by Lars Trieloff , of the Apache Sling project. We discussed whether Bunkai could be used as a resource editor for Sling. 3) It's a generic resource tree, stored in Jackrabbit, a JCR implementation. 4) All resources (web pages, pictures, scripts, et.c. are referenced using REST principles, leveraging HTTP GET, POST, DELE, et.c. to manage resources. So what Sling looks like to me, right now is the perfect thin-server. Sling can be a JSP/ish Server-side Web framework, if you want, but it also fits perfectly into a role where the server-side scripts only implement business logic, and format data, which is requested by the client. Stay tuned. Further bulletins as events warrants. Changing tack from previous posts, this article gives examples on how an application can be made without using Server-side Web Frameworks, thus reducing complexity and lowering costs. I got many good replies to my recent post "The End Of Web Frameworks". In it I argued for the need to bypass all existing Web Frameworks on the server, to avoid their high complexity costs. Instead of just bashing though, I thought I should devote some time to explain what the alternative(s) are, and how one can go about designing an application without retorting to using Web Frameworks (WFs for short). 1) Current server-side web framworks are very complex. 2) The reason that they are complex is because they try to generate a client out of the server. 3) If you remove the web client generation complexity from the server, the server becomes simpler. 4) If you program a client _on_ the client, using state of the art client frameworks, you get a simpler client (than the server-config-file client-in-parts, just add water, you had before). To begin with, on the client, nobody in his or hers right mind tries to reinvent the wheel and write hundreds of separate function supporting cross-browser oddities (read; IE) from scratch. Since several years ago there exists mature, well-tested cross-browser compatible "Ajax" libraries with copious documentation. Reason: Dojo has a simple markup language, which the dojo 'runtime' will parse when loaded. 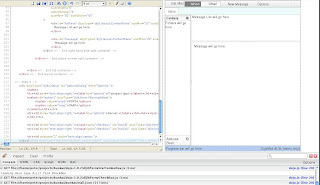 It amounts to adding a tojoType="" tag to existing HTML markup, which make compact code. Also, and more importantly, Dojo has very well designed data-binding structure, called dojo.data. Most high-end widgets such as Tree or Grid support reading their data (and sometimes writing as well) from a datastore, which can among other things be a csv file, an XML-generating service, or a custom component. This makes it easy to swap data sources, and presentations, without ever involving the server-side. Dojo is also maybe the largest open "Ajax" framework in existence today, sporting encryption, Google Gears integration, cross-browser 2D and 3D graphics, charting, a powerful template-based, modularized and easily extensible widget system, complex Drag and Drop features (even in Trees), i18N support (currency, date, time, et.c.) for widgets and even support for widgets who have to display data right-to-left like Arabic, Japanese, et.c. Disclaimer: I'm a fanboy :). Reason: Ext is perhaps the most polished "Ajax" framework, having very slick design and pixel-perfect looks. 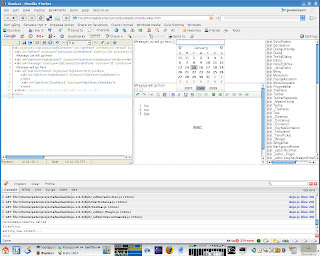 Ext also have powerful data bindings to its widgets, just like Dojo. 3. SmartClient.com (commercial but with LGPL client library). Reason: The SmartClient guys have fairly covered all bases. They have about as much functionality as previously mentioned frameworks, but with the added twist of WSDL data bindings. This means that their widgets can read directly from a web service, or you can make a form which calls a web service directly. It is really quite a lot of stuff they're releasing as LGPL, so if you're missing anything from your current choice du jour, it might be a good idea to browse about the SDK. No, we're not affiliated, I just like what they're doing. Reason: Very good data-binding widgets, such as their datatable (with good pagination examples), et.c. Reason: TIBCO has not only a very enterprise-y approach to building clients; Treetables (Matrices), extremely good support for WSDL Web services and a free visual GUI for creating browser-based clients. The reason I'm not mentioning jQuery, Prototype or Mochikit and others is that I would like to emphasize the need for data binding and management as a key issue for a client-side framework, which is missing in the more basic ones, where the emphasis is more on design and effects. Reason: Sling is a fairly young project which implements the Java Component API, which looks like a traditional web server, serving static pages from the outside, but where focus is on resource access and not page access. Each component can be implemented as a script (Rhino, Ruby, JSP or what have you). This means that Sling can be used as a stand-alone or servlet-droppable application which automatically maps requests for resources to specific scripts which generate data, thus making it more simple to focus on business-logic only on the server. Reason: You get started in no time flat (if you're using scripting, like JSP or PHP). A little longer, perhaps, if you insist on compiling and bundling stuff up. You will not reinvent the wheel again and create yet another framework. Why? Because the client resides in a separate HTML file, which loads it's js libraries by itself. You will only implement security, business logic and serve data! The SOFEA team has a very detailed description of why server-side web frameworks are complex, in an excellent PDF. Bob Bufone at rockstar apps has a very succinct and insightful post on client vs. server-side frameworks, which is a must-read. He ha a webinar on the subject with a downloadable PDF as well. Per Olesen has also done some research into which server framework to choose for the development of Rich Internet Application apps, which is an interesting read. Having fooled around for a couple of more hours today, I've managed to get a list of draggable widget class names going. You can then drag one widget/dijit onto the main 'screen' area, and the widget in question will be instantiated. It really looks very nice, even if it's not rocket science. Next step from here is to use the source code in HTML as the respository for all changes (even drops from the widget list), so that it's easy to see the skeleton code generated by Bunkai,a dn to add your own stuff and get it on the screen quickly. If you've followed my blog for a while, you know I have a pendant for visual designers. My last project - JDA Composer - tried to do too many things at once, and so it was hard to understand at first glance. Now I'm trying another tack, restricting me to just one thing - Dojo. My goal is to create a small, comprehensive editor which shows things from two mutually communicating perspectives; 1) the html/js code editor, 2) The 'scree' area where dojo widgets show up. What this means is that you'll be able to write something in the editor, click save, and it will be rendered immediately. But it also means that the rendered widgets will be editable (according to what properties the widgets (OK, dijjits :) have defined, moved about (if not restricted to a layout container) and resized (again, if allowed by layout). All changes in the visual side will immediately be communicated back to html source code in the editor. That way, I hope it will be simpler to understand, and as a programmer you'll feel that you're in control, even though there is an element of visual composition. Right now, I have only completed a proof-of-conecpt implementing the first part, which works quite all right. It's just two days work, after all.